If you live in Sutton Council's Nonsuch Ward, don't forget there is a byelection this Thursday (2nd July). You can read the ideas and the opininons of the Conservative, Liberal Democrat and Labour candidates here on the blog and, of course, are welcome to join in the debate. 1. Mrs WP has pointed out that the ice-cream van that used to jingle its way around Worcester Park has not been seen (or rather heard) for some time now. I only bought an ice cream from him on a couple of occasions but always admired his optimism at flogging Mr Whippy (that's not a euphemism by the way) in the most inclement of weathers. Anyone know what happened to him? 2. 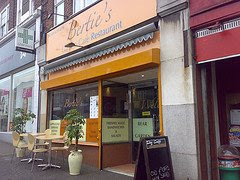 The ever-wonderful Berties cafe has been closed for a couple of weeks due to 'electrical problems'. In desperate search of a decent full-English breakfast this weekend I actually drove to New Malden. I think we should all pop round to Berties with our toolkits and lend a hand, before other people are forced to do such foolish things. 3. Shopkeepers in the building at the corner of Central Road and Windsor Road can breathe a sigh of relief. The planning application that I reported on last month has been withdrawn. 4. The Worcester Park Mini-Market (next to Mr Ink) sells seeded burger buns. I think that worthy of mention because everywhere else on Central Road seems to be permanently sold out of them during BBQ season.